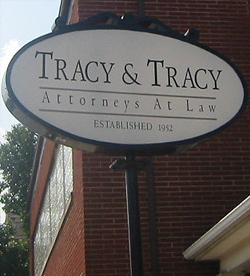 Law Offices of Tracy and Tracy LPA, Attorney at Law Conveniently Located In West Carrollton, Ohio minutes from downtown Dayton! "Serving Dayton And Montgomery County"
"Proudly and Successfully Since 1952"
At Tracy & Tracy, we understand that effective representation of your interests or claim may take us from the office to the Courtroom. One of Dayton, Ohio's and Montgomery County's most respected law firms! With collectively over 100 years of legal experience and family service! Tracy and Tracy, a family firm with family values; a firm that cares! Conveniently located In West Carrollton, Ohio just minutes from downtown Miamisburg and Dayton! nor the formation of a lawyer/client relationship. All Rights Reserved © 2013 Tracy and Tracy Co. L.P.A.